Many parents purchase trampolines for their children, believing that trampolines are toys that will provide hours of outdoor fun for kids. What many do not realize, says SpineUniverse.com, is that home-use trampolines actually cause most of the overall trampoline-related injuries, and the American Academy of Pediatrics has gone so far as to recommend that parents never purchase trampolines for homes and never allow their children to jump on trampolines at someone else's home. The American Academy of Orthopaedic Surgeons' position statement on trampolines and trampoline safety reports that the majority of trampoline-related injuries are fractures and sprains. Less common are severe injuries, but those that occur can cause paralysis or death. The American Academy of Pediatrics' AAP News adds cuts, strains and spinal damage to the list of potential injuries and says that boys and girls are injured at approximately the same rate. Around 20 percent of injuries to the spinal cord caused by trampoline use are due to jumpers bumping into each other, trying to do stunts, falling off the trampoline or falling onto the frame or springs of the trampoline, reports BrainandSpinalCord.org. In calendar year 2006, reports the Consumer Product Safety Review, trampolines caused an estimated 109,522 injuries. Of those injuries, children from 4 years old and younger sustained an estimated 15,541; children from 5 to 14, an estimated 71.265; older children and young adults 15 to 24, an estimated 14,571; adults 25 to 64, an estimated 7,836; and adults 65 and older sustained an estimated 309 injuries. About 104,729 of those individuals of all ages who were injured were treated in emergency rooms and released. The rest, an approximately 4,793, were either hospitalized or dead on arrival. SpineUniverse.com reports six trampoline-related deaths since 1990. A trampoline safety alert from the U.S. Consumer Product Safety Commission, or CPSC, recommends several steps to reduce the risk of serious injuries. First, only one person at a time should jump on the trampoline. Do not allow jumpers to attempt somersaults. Always keep the trampoline springs covered with padding, and do not place the trampoline too near trees or other structures. Only allow children 6 and older to jump on a full-sized trampoline, and supervise all children on trampolines. Place an enclosure around the trampoline to prevent falls to the ground, and do not place a ladder near the trampoline because small children can potentially climb the ladder and jump unassisted. 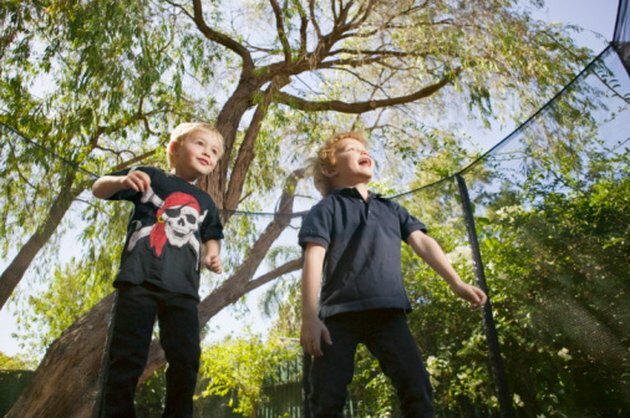 The AAP warns parents and guardians to make sure their children's schools do not have trampolines and to inspect home trampolines regularly for tears, rust and detached springs or pads. Homeowners should check with their insurance companies before purchasing a trampoline for the home. Because of the large number of accidents and injuries incurred on trampolines, insurers are wary of trampolines and often attach trampoline exclusions to their policies. This means that if someone is injured on a trampoline at your residence, homeowners insurance may not cover it, leaving you vulnerable to having to use personal assets to cover damages and legal costs, reports Insurance4USA.com. Families.com adds that insurance companies may also cancel a policy entirely if a drive-by inspection reveals a trampoline in a homeowner's yard. 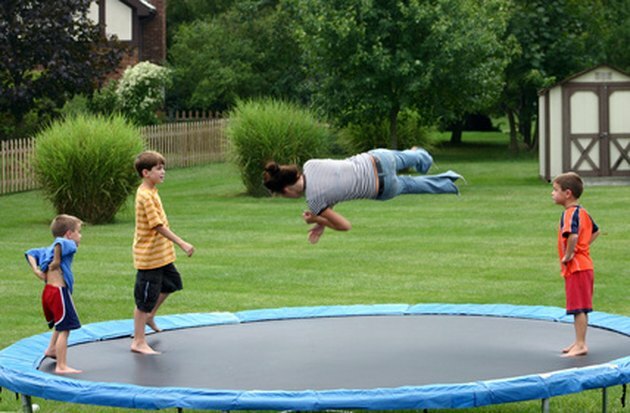 Insurance4USA.com: Is a Trampoline Accident Covered Under Homeowners Insurance?